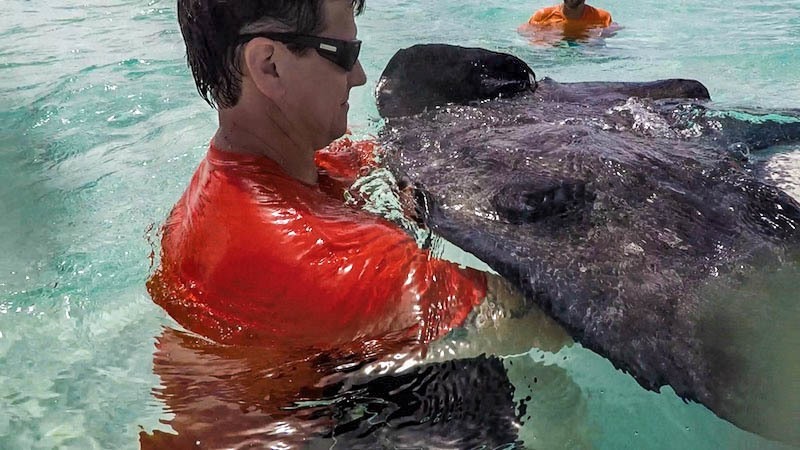 When we planned our honeymoon in Grand Cayman the search was on to find unusual experiences, the standout being Stingray City, a sandbar only a mile from shore only 3 feet deep where stingrays move freely among those brave enough to enter the water. The gentle stingrays are happy to let you feed them, touch them and hold them. 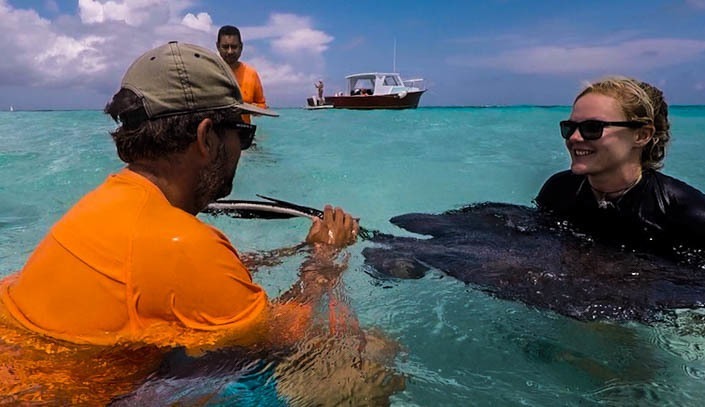 We knew that this was a wildlife adventure that we would always remember so the hunt was on for the best way to have the stingray encounter. On previous visits, I‘d been on excursions where large boats drop up to 75 people at one time onto the sandbar with a few guides. These guides gave a few facts while I tried to overhear their remarks between all the squeals, oohs and ahhhs. Needless to say, I didn’t get much one on one time with those tours. So this time I wanted something more personalized for my honeymoon adventure with Keith. This time was going to be different. We stayed away from the crowds and agreed upon a more exclusive private charter boat company that delivered real VIP service. I always say the experience is totally different if you have the right guides to immerse you in the wild. That’s what I found with Crazy Crab whose motto is to “arrive as guests and leave as friends”. We were about to learn how true that is. It started with the booking process. 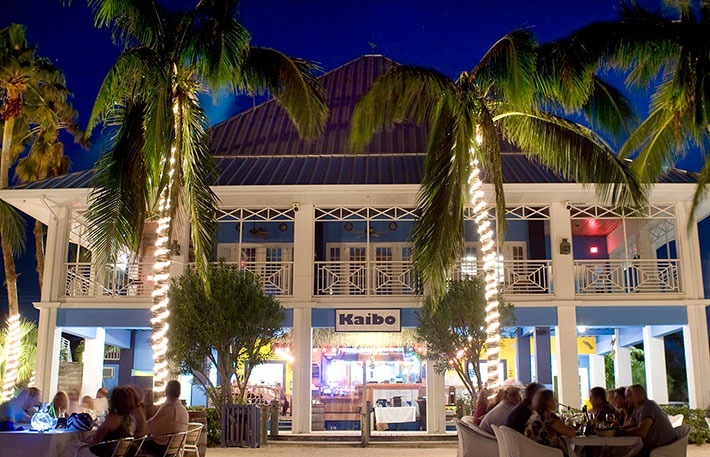 I clicked on the Crazy Crab website and chatted online with the owner Troy. I learned about how Keith and I could customize our day on a private boat. 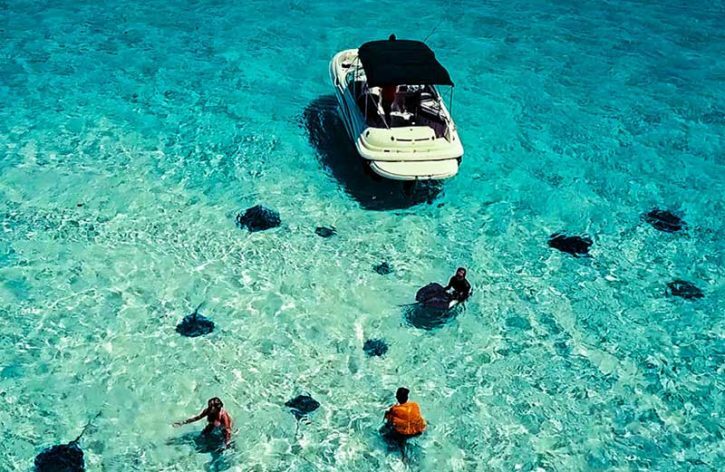 We could hold sea stars at Starfish Point, play with frolicking stingrays at Stingray City, snorkel pristine reefs and have quite the story to tell with all the pictures and videos we captured. Our knowledgeable guides for the day were Mandy, a marine biologist, and Jaco, originally from South Africa. Before even venturing into the water at Stingray City, Mandy and Jaco briefed us on safely interacting with wild stingrays. They demonstrated the stingray shuffle so you don’t accidentally step on them. 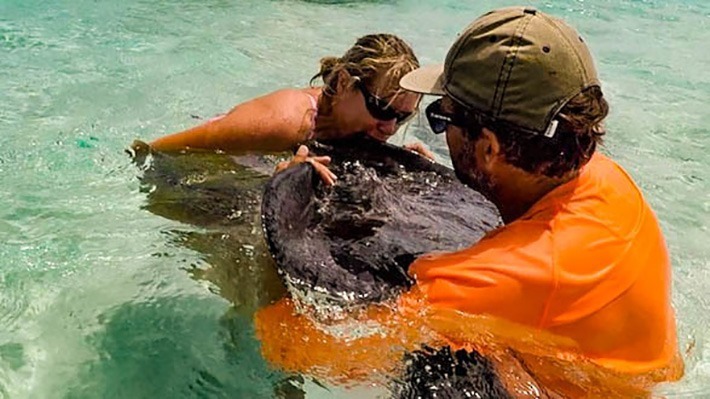 Mandy explained with a cute demo stingray the correct way to approach and handle them. These playful and curious creatures have been conditioned for years to swim around the sandbar when they hear the fishermen’s boat motors. Years ago the fishermen dumped fish remnants into the water as they anchored on the sandbar cleaning the catch. Because of this, stingrays are abundant and hang out for a free meal, a petting or to rest in your arms even when their tummies are full. 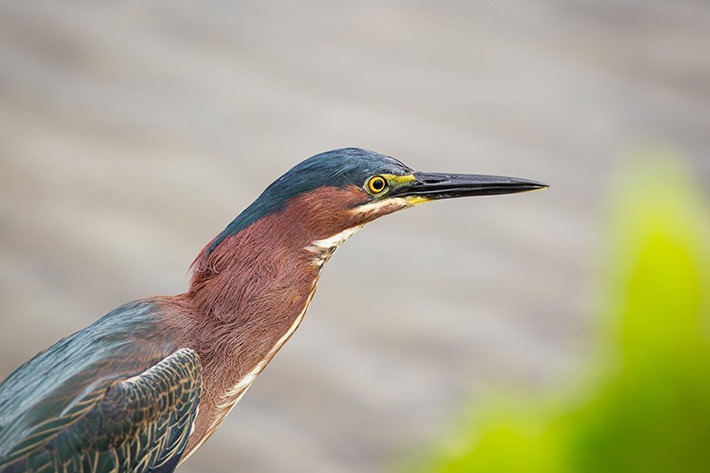 Looking out into the blue-green waters I saw dark spots moving under the surface coming towards me and then out of sight under the hull of the boat. It was a little scary at first; dozens of stingrays, mostly large females, coming to play and feed with you. Mandy taught us about feeding the stingrays, most of which she and Jaco knew by name. The lesson was to hide your thumb so you don’t get it sucked up, like a Hoover vacuum cleaner. Mandy emphasized keeping the squid out of the water until we are ready to share. An overzealous stingray brushed up on my stomach while another one goosed me as they were welcoming me into their territory. Now I know where the concept of stingray hickeys evolved and I definitely didn’t want to take home a souvenir from these ocean friends. Luckily I escaped any hickeys. Every boat is allotted just one pound of delicious, juicy squid to feed these hungry rays. So it doesn’t matter if you have a family on a boat or 75 people. That’s another reason for choosing Crazy Crab over larger boats; Keith and I had many turns feeding different stingrays. I kept looking around and saw large boats with a mass of people come and go after just a short stay at Stingray City. They obviously went through their squid quickly. We learned that stingrays usually always have barbs unless they’ve been injured. Frisbee and Boomerang, a mother and baby ray, frequent the sandbar but unusually don’t have barbs. Originally it was assumed that Frisbee, the mother had been injured but after Boomerang was born missing a barb, they realized genetics played a role. Tradition is, nobody goes home on the boat without kissing a stingray for 7 years of good luck. Since we wanted to start our marriage out with good vibes we decided we better pucker up our lips. Surprisingly, giving a stingray a “raspberry” kiss was harder than we thought. Perhaps it was because we were nervous or we just weren’t used to giving a wild animal a kiss. We stayed at the sandbar for at least an hour and a half playing with the stingrays and learning about them. Keith and I were in awe at how these beautiful creatures welcomed us to their ocean sanctuary. 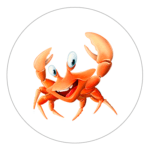 Crazy Crab designed a personalized adventure that we will always remember. With Troy and his team, you’ll arrive as a guest and leave as a friend.